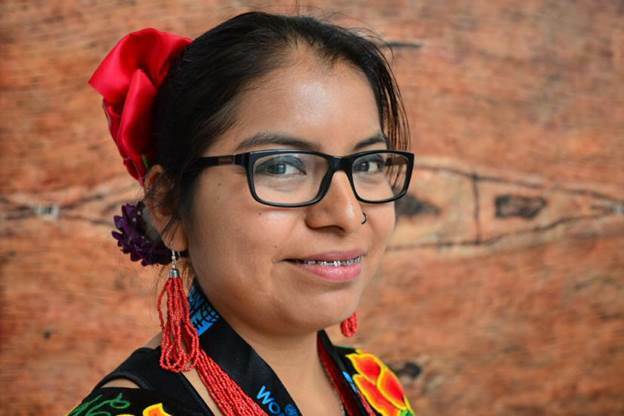 In this interview, Paulina Schwaner, an IFAD consultant and former journalist from Chile, spoke with Dali Ángel Pérez, 28, a young indigenous leader from the Zapoteca, the indigenous people of Mexico. When Pérez was a child, her family fell victim to the ongoing agrarian conflict and were forced to flee their homes to take refuge elsewhere. Years passed before they were able to return to their home. Pérez became committed to defending her land which belonged to her forefathers and was soon bestowed upon her. Q: Dalí, at 24-years-old you were awarded the National Youth Award in Mexico 2012 in the Human Rights category. What did it mean for you to receive this award? “The prize is a recognition given by the Mexican government to youth in general. This was not a prize aimed at ‘indigenous’ youth as such and I was nominated by different organizations in which I have been involved. It is not an individual award, rather I like to consider it a recognition of all the work we along with other young people at a community level are doing. Q: Currently you are working with an Indigenous women’s organization called CIARENA. What is your role there? “My role in CIARENA is coordinating the youth and childhood committee that looks into representing and building on youth aspirations through workshops. We are a committee composed of six young people who work daily in the communities to advocate and provide tools for human rights and rights of indigenous peoples and, specifically, the rights of indigenous children and youth. Q: In your line of work, what challenges have you faced? “Our main challenge is highlighting the regional and community level issues youth face in an international arena. One fundamental challenge has been attempting to have more youth representation in these spaces. Q: What do you think is the greatest potential of young people? Q:What do you think could make rural life more attractive for young people? “In our communities, there are a lot of youth migrating and they go to the cities or they go to the United States for a number of reasons and factors. To begin with, there is a lack of support towards rural development and for young people to achieve their own initiatives. With the lack of support, these situations lead to depression amongst young people. In the area where we work, there are many agrarian and land conflicts and the young generations are finding it difficult to access land in order to cultivate crops. Q: How do you envision the future for indigenous youth people in Latin America? “I think that there has been much progress on indigenous peoples issues that were previously not recognized as such; at least now people call us indigenous peoples. The theme indigenous youth is starting to emerge as it has happened with indigenous women. I feel in the near future, the articulation of indigenous youth will progress together with the collective rights of indigenous peoples.